Policies and Procedures, Meetings, Committees etc. Please review the LA BOSCOC Governance Charter v3.6 for the full list of changes. Each Region now has a Regional Subcommittee (e.g. the Lake Charles Subcommittee, Natchitoches/Sabine Subcommittee). Each Regional Subcommittee is chaired by that Region’s Board member. Good Standing requires each member to belong to at least one Regional Subcommittee. More details on subcommittee registration will be forthcoming soon. Good Standing requires members to attend at least 1 meeting of the full membership each year. Reduced from 3. Good Standing requires members to attend at least 2 meetings of their Regional Subcommittee each year. 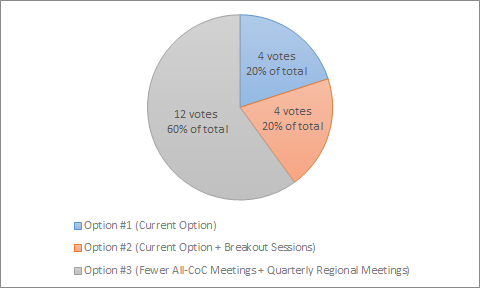 Regional Subcommittees are required to meet on a quarterly basis. Regional Subcommittees are required by the Charter to develop a written regional outreach plan and to coordinate that Region’s PIT Count. The LA BOSCOC Governance Charter v3.6 can be found here.